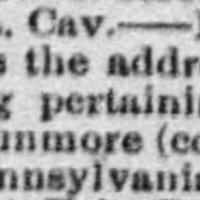 Tags: Pensions (Civil War) ? 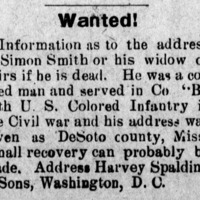 Nathaniel Dunmore is searching for soldiers who know details of Edmond Dunmore's death. 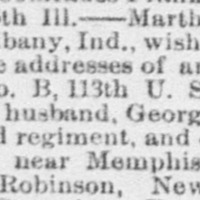 Enlisted from Pennsylvania during the Civil War. 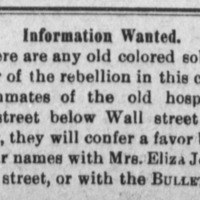 [Presumably related to a Civil War pension application]. 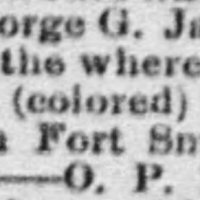 Jameson, Aetna, Kansas, searching for members of the 9th Kansas [presumably to gather testimony for a Civil War veteran's pension]. 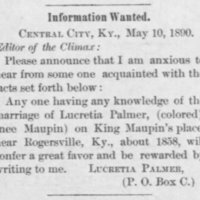 Lucretia Palmer (nee Maupin) searching for someone familiar with her marriage on King Maupin's place, near Rogersville, KY, about 1858. 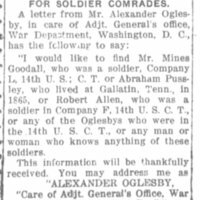 [Palmer presumably needed this testimony to apply for a Civil War widow's pension]. Rev. Geo. 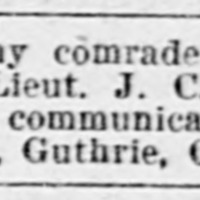 Nichols searching for address of lieutenant, U.S.C.T.